Aidan – a horn shape meant to suggest Aidan’s encounter with the stag. The prototype looks much different than the recent B35, more of a true horn. Brendan – a flowing three-quarters-bent shape reminiscent of Brendan’s coracle, pointed in front and back of bowl to resemble a ship, a bit like the Shaw Writer’s Collection, with “creases” fore and aft. Brigit – an unusual four-panel full-bent rhodesian hybrid design inspired by St. Brigit’s Cross. Columba – a swan-neck billiard, inspired by Columba’s meeting with the Loch Ness Monster in 565 A.D.
Kevin – a straight chimney, inspired by the round Towers of Ireland. Skellig Michael – a bog oak rusticated three-quarter bent bell, inspired by the six corbelled-stone beehive cells of the 6th-century monastery that perch atop Skellig Michael Skellig, near where Luke Skywalker was seen recently in The Force Awakens. The designs were a collaboration between the craftsmen and women in Sallynoggin and local Dublin craft potters and artists. A second unusual feature is that all pipes will feature the graduated-bore P-Lip. The Brigit will be a System, featuring the System reservoir. “The idea is that if it proves popular, it will eventually become part of the System line,” Whelan added. All stems will feature the imbedded aluminum P logo. The sterling bands will feature a triquetra, or Celtic Trinity knot, soldered on the band. Sets will be numbered and laser-stamped S/001 through S/700 (all six pipes bearing the set number). Box art features a photograph of the beehive huts on Skellig Michael, the tiny island and Puffin refuge off the coast of Ireland. Retail is expected to be about $1200. As Peterson has shown throughout its 150+ years, often the way forward is the way back. While management was reluctant (as always) to comment on who actually came up with the idea. Perhaps it has to do with the emerging ecumenical spirit washing over Ireland and the desire of the younger generation to find spiritual unity in a common and much older heritage predating the entrenched religious establishments. I can’t wait to see these, I will be seriously considering the full set. And big oak has been very intriguing to me for a long while now. 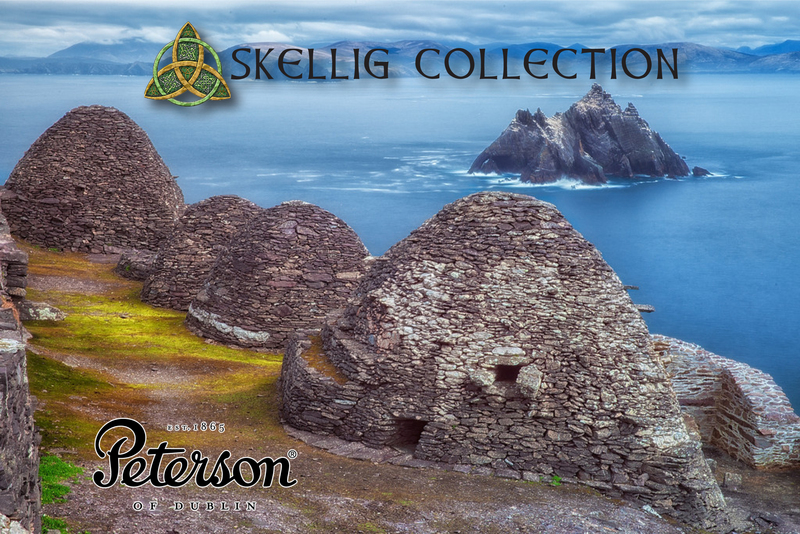 I was EXTREMELY GRATIFIED to receive an email from Peterson this morning asking about the Skellig Collection! I figured everyone would read APRIL 1st at the top or HAPPY APRIL FOOL’S DAY at the bottom and understand immediately, but evidently not. The gratification came in two parts– 1) customers were asking not only about the Skellig, but about legitimate Peterson collections they’d read about here at the blog and wanted to know how to acquire them; 2) I got to design my own Peterson collection! Already looking forward to next April Fool’s Day. Yup. I think a genuine Irish bog oak would be amazing. I’ve owned Italian morta pipes (bog oak) and they are very different from briar, but I like the taste. I understand retrieving the stuff and processing it is quite a bit more difficult than obtaining briar, but I know there’s quite the cottage industry in Ireland making decorative whatnots–I have a marvelous high cross rendered in bog oak from my first trip to Ireland in 2009. So yeah, I’m ready to be taught a lesson!! You are kidding of course. I had to reread the letter to make sure. April Fools Day is (or was) actually quite the tradition in Ireland, at least from what I have read. I’m used to these kind of jokes, as it’s a strong tradition here in Tejas as well. I know Paddy Larrigan has read the blog, and David Blake as well, but I don’t think the Peterson folk currently employed have the time to read it–they’re too busy making great pipes for us.